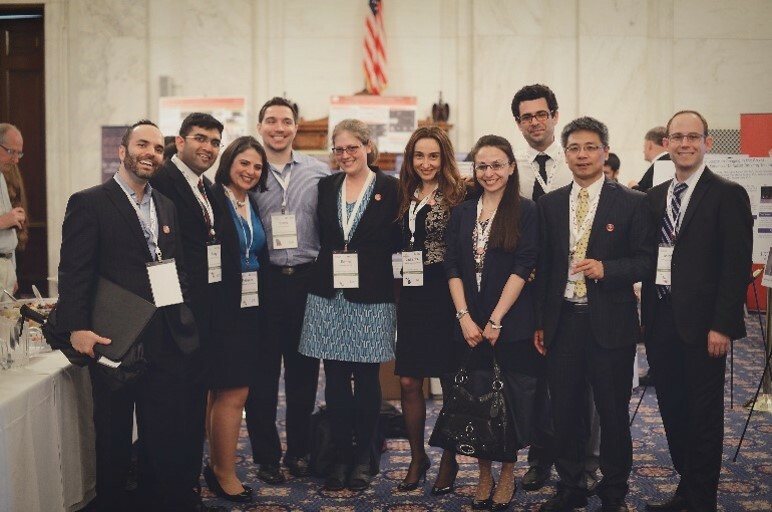 The Academy of Radiology Research is proud to announce the 2016 recipients of stipends from the Academy of Radiology Research Academic Council (ARRAC) to travel to Washington DC and participate in the 7th Annual Coalition for Imaging and Bioengineering Research (CIBR) Medical Technology Showcase on Capitol Hill. Each of these early career investigators has a primary professional appointment in an academic Radiology Department that is a member of ARRAC, and was nominated by their Department chair or vice chair for this prestigious honor. There were 30 applicants presented for consideration of travel awards for 2016, and while they were all recognized as exemplary, resources dictate that the awardees be limited to 12 in total. A subcommittee from the Council of Early Career Investigators in Imaging (CECI2) submitted their chosen candidates which were accepted by Academy leadership. All applicants will be invited to create a research poster to be displayed in their Senate offices and at the Medical Technology event. Academy staff will deliver the poster to the Senate offices and display the posters at the event. Instructions for the posters will be sent this week to all applicants. Award recipients have the opportunity to prepare and present their research poster at the medical technology showcase and by their selection for the award, become a member of CECI2. The Academy of Radiology Research formed CECI2 as part of its commitment to ensuring that the next generation of imaging scientists understands the importance of research advocacy. Under the leadership of CECI2 Chair, Dr. Rebecca Rakow-Penner of the University of California at San Diego, this group of early career researchers collaborates with the Academy to advocate for federal investments in imaging research. In addition, this Council serves as a networking and educational resource for its members. Travel awardees will have the opportunity to meet with Program Directors and staff at the National Institute of Biomedical Imaging and Bioengineering (NIBIB) at the National Institutes of Health (NIH) and additional Institutes and Centers with significant imaging portfolios based on the interests of the awardees. Additionally, attendees will visit their Congressional offices the day of the medical technology showcase. The 7th Annual Medical Technology Showcase recognizes how imaging technology impacts patient care from detection to diagnosis and treatment. The event will be held on Tuesday, April 12 from 5:00pm – 7:00pm in the Kennedy Caucus Room, 325 Russell Senate Office Building. Attendance to this event is free, and registration is now available online at http://www.imagingcoalition.org/med-tech-event-2016/. For questions and more information, please contact [email protected]. About the Academy for Radiology Research Academic Council (ARRAC): ARRAC is comprised of the top academic radiology departments in the U.S. and focuses on increasing awareness of the improvements in patient care made possible by the cutting edge imaging research being performed at the nation’s premier institutions.